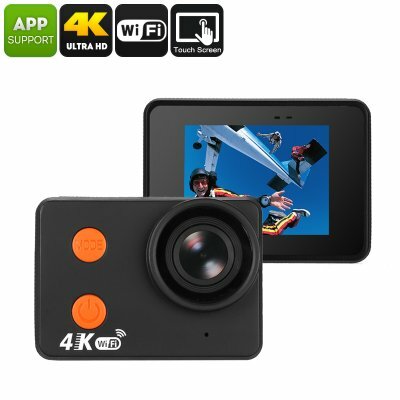 Successfully Added Waterproof 4K Sports Action Camera - Bare Metal Body, 4K 30FPS, 160-Degree Lens, 20MP CMOS, 2 Inch Display, WiFi, 10M Waterproof to your Shopping Cart. This high-end 4K action camera features a stylish and tough bare metal body. Not only does this give your camera a cool and high-end look, it also makes it extremely durable and resistant to water. This sports action camera is unique in the way that the camera itself is waterproof up to depths of 10 meters. Therefore, you won’t need a waterproof casing anymore the next time you head out swimming, scuba-diving, surfing, or skiing. No matter the type of sports you enjoy, this waterproof action camera will follow you anywhere without you needing to worry about it breaking down. What further separates this 4K action camera from similar sports action cameras is the fact that it packs state of the art hardware. With its 20MP CMOS sensor, it allows you to shoot stunning 20MP pictures and 4K footage at 30fps. This means that you can capture all your upcoming outdoor activities in great detail and vivid color. All recordings can be watched back instantly on the camera’s 2-Inch display. Like this, you can be guaranteed that you’ll always end up with the perfect shots that can later be shared with all your friends and family back home. With WiFi support, your 4K action camera provides you with an easy way to share video and pictures straight onto your smartphone or tablet. This brings along great efficiency as you’ll no longer need a cable to transfer files. The camera itself packs a 1050mAh battery that lets you use your gizmo for up to 60 minutes in a row. With a 160-degree wide-angle lens and different shootings modes, your 4K camera is sure to meet all your recording demands. This Waterproof 4K Sports Action Camera comes with a 12 months warranty, brought to you by the leader in electronic devices as well as wholesale action cameras..